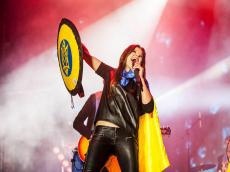 Ruslana, a Ukranian singer who won the Eurovision 2004, surprised her fans with an original manner of performing during the concert in Baturyn on the Independence Day of Ukraine. "This is how the Carpathians sing. It's is the oldest style of singing, similar to the Eastern mugham (Azerbaijan).This technique has survived only a few in the world," the singer wrote under the video on her Facebook page. Ruslana repeatedly visited the capital of Azerbaijan, performed with concert programs. Last time she participated in the Global Forum of Youth Leaders in Baku, which was held in August this year. "Azerbaijan is a unique and democratic platform for bringing together completely different people. I always come to Baku with great pleasure. Azerbaijan is my second most important place after Ukraine, and I have many pleasant memories linked with Azerbaijan, including professional plan, as several joint projects have been realized. I know Azerbaijani artists, I learn mugham, because unusual music is of great interest to me. This music is close to me,” she said then. Ruslana also plans to hold several presentations in Baku in near future.